Dividend Days - Epoch Investment Partners, Inc.
Dividends – in the form of cash, share buybacks, and debt repayments – are set to rise in the years ahead. 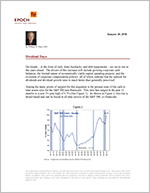 The drivers of this increase will include growing corporate cash balances, the limited nature of economically viable capital spending projects, and the evolution of corporate compensation policies: all of which indicate that the outlook for dividends and dividend growth rates is much better than generally perceived. Among the many points of support for this argument is the present state of the cash to total assets ratio for the S&P 500 non-financials. This ratio has surged in the past 12 months to a new 35-year high of 9.7% (See Figure 1). As shown in Figure 2, this rise is broad-based and can be found in all nine sectors of the S&P 500, ex-financials. When considering the likelihood of dividend growth, it is important to remember that companies have options with regard to spending free cash flow and excess balance sheet cash. Three of these choices are effectively dividends: cash distributions, stock buy- backs, and debt retirements. The other choices relate to internal capital projects and acquisitions. Given the low operating rates and the large supply of excess labor that characterize today’s economy, a surge of internal capital spending looks unlikely. Acquisitions are possible but not with private equity firms. Most deals, when they happen, will be strategic in nature, and must be accretive in value to the acquirer or they will not occur. Put another way, the return from capital deployed in an acquisition must equal or exceed the acquiring firm’s cost of capital. Otherwise, such activity destroys shareholder value. To get a broader perspective on the historic allocation of cash by S&P 500 firms, let’s turn to Figure 3, courtesy of Goldman Sachs. Here, we see the ten-year breakdown of free cash flow deployment strategies among share buybacks, cash dividends, R&D spending, cash acquisitions, and capital expenditures. Utilizing the categories in Figure 3, if we argue that capital expenditures plus R&D plus M&A activity equals growth opportunities, then buybacks plus cash dividends equals capital returns to shareholders. Following several years of returns to shareholders constituting an average of 34%, (1998-2003), we see a sharp rise in returns to shareholders beginning in 2004 through 2008, averaging 45%. Following the financial crisis and ensuing recession, this number fell to 32% in 2009 when, according to Standard & Poor’s, dividend cuts for the S&P 500 (including financials) approximated $58 billion. Last year, for the first time in 50 years, more American companies cut dividends than raised them. However, this trend should reverse dramatically in 2010: as shown in Figure 3, Goldman forecasts 37% of cash flow will be returned to shareholders in 2010, growing to roughly 40% a year later. Today, the economic climate and corporate balance sheets in the non-financial sectors suggest excess capital will be returned to shareholders via dividend-based strategies. What’s more, the compensation system incentives in most companies encourage this outcome as well. Whereas “stock option” plans can encourage retention of capital by management for growth opportunities, “restricted stock units” (RSUs) do not have that bias. The latter equity award generally contains a provision whereby management receives dividends on unvested stock as well as vested stock. (It should be mentioned that dividends on unvested stock are taxed at ordinary income rates.) Therefore, to the extent compensation processes are designed to drive behavior, the return of excess capital to shareholders is enhanced by this type of reward structure. Over the past several years, stock option plans have been largely supplanted by RSU structures in most public companies. The conditions may well exist for a greater number of companies to start or to continue paying dividends, but will these dividends grow? We say yes. Dividend growth rates are largely determined by the growth in free cash flow, which can be defined as the cash available for distribution to shareholders after all planned capital expenditures and all cash taxes. Figures 4 and 5 highlight the fact that free cash flow yields have risen meaningfully over the past six quarters as a result of the dramatic pullback in corporate capital spending and the decline in the equity market as revealed in Figure 5. Free cash flow yields are elevated for eight of the nine non-financials sectors reviewed. In some cases, these yields are more than two standard deviations above their 20-year averages. Assuming modest real economic growth this year, the outlook for growth in dividends is very positive. With respect to the rising importance of dividends as a contributor to total returns from equities, consider the following. There are only three determinants of equity returns: dividends, earnings, and P/E ratios. With P/E ratios unlikely to expand given the low level of interest rates, equity returns can only come from dividends and earnings. Dividends, particularly in the short run, may well grow faster than earnings given the excess cash on corporate balance sheets. For a broader perspective, it is worth recalling that over the entire 1925-2009 period, dividends and their reinvestment equaled nearly 50% of the return in stocks. Dividend strategies are back, and they may well dominate equity strategies over the next few years. Epoch’s investment methodology is built upon the concept of identifying firms that intelligently allocate free cash flow among the five strategic choices available to them: cash dividends, share repurchases, debt pay downs, acquisitions, and internal capital projects. In today’s climate, it is especially important to keep in mind that the common shares of high free cash flow companies generally perform well in recessions and slow economic growth periods. This is the environment we anticipate in the period ahead. In other words: dividends will be a primary determinant of total equity returns in the days ahead.